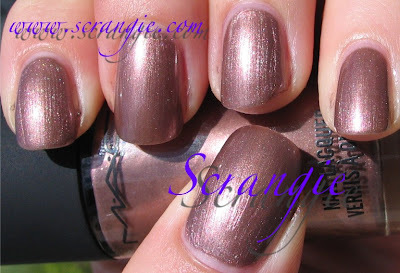 Scrangie: MAC Polishes and Purple By Night Dupe..? About that Givenchy Purple By Night frankenpolish idea I had... I had an epiphany! Givenchy Purple By Night = OPI Ink? Last night I wanted to do a purple color for my mani, and I grabbed my all-time favorite polish: OPI Ink. It's so close to Purple By Night but better! I don't have a good picture of it because for some reason it turns blue in every picture I take. I don't know why it does that- it's very clearly and obviously purple on my nails. I will get a good picture of this color if it kills me! So why do I like OPI Ink better? It's more purple. It has DEPTH. It's super shimmery and it makes me happy. But, it's not an *exact* match to Purple By Night. It's pretty flippin' close though. I think adding a touch of pastel shimmer and maybe a little black would make it exact. I'll find out when I get another bottle- I can't sacrifice my precious bottle to duplicate a polish I don't like as much. After a while I got curious and added a coat of Misa Confection Section on top. Not a match, but it sure looks cool. Great combination for you layering lovers out there- OPI Ink and Misa Confection Section. Now that that's out of the way, how about some pictures? Here's my entire MAC polish collection. As you can see, I really don't have very many. This is because of the experiences I've had with MAC polish. It's very hit-or-miss, formula wise. The old formula was pretty bad, watery or sometimes too thick, takes too long to dry, hard to apply. 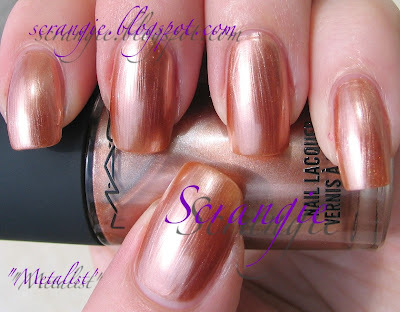 As a result of the formula issues, for quite a long time I completely avoided MAC polish. I regret that now, because I passed up some very cool colors. I'm happy to say that the new formula MAC polishes are 100% better. I have not had any problems with the polishes released in the past two or three years. Blue Sprinkles. Silvery blue shimmer with slight rosy duochrome and copper squares. Sweetie Cake collection. $$$$$ Yes. Smooth, foil metallic silver. Heatherette collection. Dark Angel. Deep cream purple. I'm not sure which collection this is from, but it's a few years old. I bought it because it's the name of a VNV Nation song. Gold Veneer. Perfect metallic light gold. Antiquitease collection. Illegal Purple. Deep, dark vampy brownish eggplant. Cult of Cherry collection. Kid Orange. Impossible to photograph properly- it glows. Bright orange red. No idea what collection this was from. Lola Devine. Gorgeous squishy-looking peachy pink cream. Heatherette collection. Metalist. Smooth and highly reflective coppery gold metallic. Neo Sci-Fi collection. Neon 8. 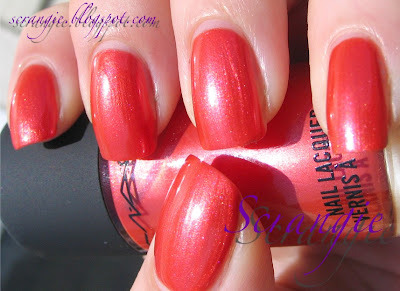 Bright orange shimmer with slight pinkish duochrome. Neo Sci-Fi collection. Naughty Nautical. What a horrible, horrible picture of this! I'm ashamed. It's a deep blackened-blue shimmer. Naughty Nauticals collection. Phosphor. Amazingly gorgeous glowy golden yellow shimmer. Neo Sci-Fi collection. Plasma Blu. Hot turquoise blue shimmer that practically lights up on your nails. Neo Sci-Fi collection. Rainy Day. Blue-grey gunmetal metallic shimmer. Blue Storm collection. Seasonal Peach. Drop-dead gorgeous vintage pinky-peach cream. Cremesheen collection. Silverstruck. Antique metallic with a hint of reddish tint. Cult of Cherry collection. Wildfire. Seriously watery blackened purple shimmer. Smoke Signals collection (I think...). I might be wrong on a couple of the collections, so please feel free to correct me if you see a mistake! That's my MAC polish collection (minus Nocturnelle because it seems to have escaped!) as of now. I plan to expand this at every chance I get! Most of these colors are discontinued but I've seen almost all of them at Cosmetics Company Store outlets fairly recently. They run about $10 retail and from $7 and up at the CCO. I wish I loved OPI Ink, I want to love it, but it just does not love me. I hate how it looks on me for some reason. They are lovely............ Silverstruck is me!!!!!!!!!!!!!! Thanks for showing them off to us! I haven't seen a single colour that doesn't look great on you! Love your pictures. Welcome back from vacation! i hope you had a good one...anywhere exciting?? Great swatches! I had given up on MAC polish after trying a beautiful deep blue/green/purple-black trichrome, whose name escapes me - it was from about 5 years ago, pre-Whirlwind, which was lighter - that looked so fabulous in the bottle (think Glacier Bay Blues but a lot more depth). It chipped in an hour, even after 3 attempts, so I trashed it. I may give them another try, as I do like all of their other products. From your swatches, Rainy Day looks a bit like Zoya Freja. Is it similar? Any chance of comparing Ink & By night? I had Ink but no longer have it. I have By Night. From memory and pics I really didn't think they look similar but since I no longer have it I can't totally say. Anyhow, I think you are the only person that Season Peach looks good on. Other pics I've seen look off or chalky. Looks great on you though. I love $$$$, so smooth and perfect! Silver is one of my favorites anyway, and this looks even better than my all-time lemming, Essie Loophole. Rainy day is also very cool. I definitely want to try that one too! Thanks for the great pics! Hi, love your pics! I like Lola Divine. Is there a dupe for it? You should try Steamy from the Barbie collection, its now a perm. Its the most amazing barbie pink and I always get compliments on it! Micromin, isn't it a stunner?? 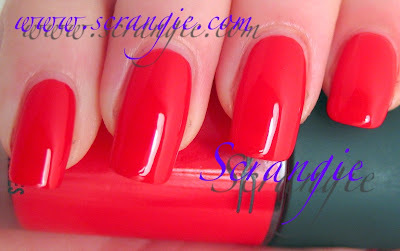 VampyVarnish, oh how cooool! Thanks! Melli, thanks! Nothing exciting :) I think I know which color you're talking about! The polishes have definitely improved. Anonymous, hmm, Zoya Kylie2 is kinda similar but I can't think of an exact dupe!